I think for adult dogs of True Instinct Not Grain, Medium-Maxi with salmon is the complete food that your pet needs for a healthy development. The I think for adult dogs of True Instinct Original Medium – Maxi with chicken provides your pet a number of natural ingredients to enjoy a balanced diet, healthy and with a delicious taste to chicken. 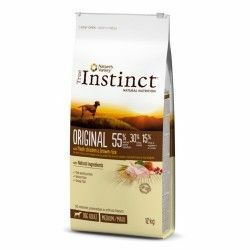 True Instinct is Not Grain is a feed without grain or gluten for dogs that combines optimal compatibility with some exclusive ingredients and a nutritional value excellent.